Brussels was again the site of SPIE Photonics Europe; above, the tower of the city's Town Hall features in a slide shown by general chair Francis Berghmans. It’s a quality conference that goes from strength to strength, with excellent organisation and a great range of speakers. 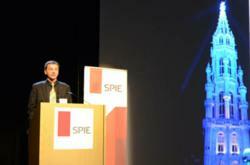 SPIE Photonics Europe upheld its reputation as a technical event of high and growing quality, as more than 2,030 attendees from throughout the world gathered in Brussels 16-19 April to discuss advances in a full range of optics and photonics topics. The increase of nearly 6 percent in technical attendance this year over the previous event served as evidence to the up-trend. Industry sessions providing data on trends and projections in solar energy, solid-state lighting, laser, and other sectors, featured talks by EC leadership, industry, and academia, and an exhibition including major companies as well as start-ups complemented technical talks by top researchers and technology developers. Francis Berghmans (Brussels Photonics Team [B-PHOT], Vrije Universitet Brussel), Ronan Burgess (European Commission), Jürgen Popp (Institute of Photonic Technology Jena), and Peter Hartmann (Schott) served as General Chairs of Photonics Europe. Hugo Thienpont (B-PHOT) was Honorary Chair. A low-cost LED-based device that improves wound healing by the use of light and a noninvasive device for monitoring blood vessels won top honors in the Photonics Innovation Village competition organised by B-PHOT with the support of SPIE. The goal of the competition was to encourage and support research from universities, not-for-profit institutions, and research centres working on new applications and product development. Prizes provided by the Brussels Capital Region and SPIE were awarded for five technical projects in individual and multilateral categories, along with a special-category prize for a project to provide science, technology, engineering, and mathematics (STEM) education materials to secondary school students. A total of 18 projects were entered, representing 12 countries. Winner Light4Tech, associated with Photonics4Life, for "Low-cost and easy to use photohaemostatic device based on LED technology." Runner-up EPFL Lausanne, associated with MEGAFRAME and SPADnet, for "CMOS single-photon time-correlated SPAD arrays for biomedical applications." Winner Humboldt University and its spin-off company Delta Vision, for "Table-top setup for time-resolved detection of singlet oxygen luminescence in solutions and cell suspensions." Runner-up Resolution Spectra Systems, a spin-off of Joseph Fourier University, for "ZOOM Spectre: compact high-resolution high-rate spectrometer." Runner-up Bilkent University, affiliated with NanoDev Scientific, for "MoBiSense: a truly low-cost and disposable mobile molecular sensor as a multipurpose sensing platform." EYEST (Excite Youth for Engineering Science and Technology) won a non-technical prize for its Photonics Explorer program to create novel intra-curricular optics kits for secondary schools. In recognition of outstanding careers and contributions to the field, Hans Tiziani (Universität Stuttgart) was presented with the SPIE Chandra S. Vikram Award in Optical Metrology, and Andrea Alù (University of Texas, Austin) was presented with the SPIE Early Career Achievement Award. Paolo De Natale (INO-CNR) was honored as a new Fellow of SPIE, one of a total of 75 new Fellows of the society this year. Evaldas Stankevicius Institute of Physics. Read more about the week's activities, view videow presentations, and browse the photo gallery at http://SPIE.org/PEnews. SPIE is the international society for optics and photonics, a not-for-profit organisation founded in 1955 to advance light-based technologies. The Society serves nearly 225,000 constituents from approximately 150 countries, offering conferences, continuing education, books, journals, and a digital library in support of interdisciplinary information exchange, professional growth, and patent precedent. SPIE provided over $2.5 million in support of education and outreach our programmes in 2011.